South Berks Concert Band is a community woodwind, brass and percussion music group which has performed in and around the Reading and West Berkshire area for over 40 years since our formation in 1976. We are based in Mortimer, Berkshire, rehearsing every Friday evening at Mortimer Methodist Church Hall. We currently have about fifty members from the local area who have a mix of ages, experience and abilities, but all pride ourselves on our commitment to improving the band and helping build each other’s musicianship in order to bring great quality live music to our audiences. Whatever your tastes in music, whether that be film scores, selections from musicals, jazz pieces, traditional marches, contemporary wind band music, classical works, original compositions or arrangements of your favourite pop music, it is all there waiting for you to hear and enjoy at our concerts. Why not discover the delight of listening to a live performance for yourself? The band includes 16 different types of wind instrument: woodwind such as flutes, clarinets and saxophones, and brass such as trumpets, trombones and French horns. There are also many different percussion instruments, ranging from the tiny triangle to huge timpani. The different combinations of instruments in a windband can create some wonderful sounds that you may not expect! We perform several concerts each year, including evening concerts, afternoon family events, and at local fayres and bandstands, as well as going on tour abroad and performing at local charitable events. 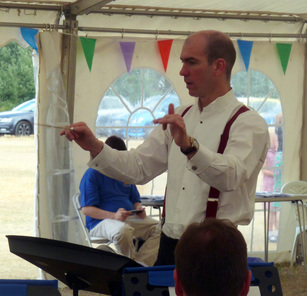 Our last concert was an afternoon summer event in a marquee on Mortimer Fairground. We are a self-supporting group, and over the years have helped raise thousands of pounds for charity.